This is a very cute set of jars that goes well with my farmhouse style kitchen. The lids are airtight and the jars are well-made and very spacious. 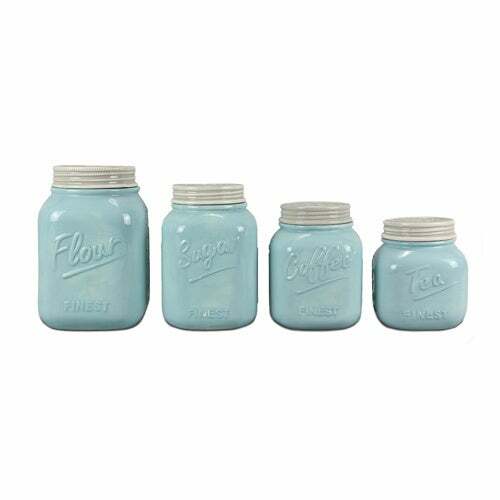 Add a little country charm to your kitchen with this stylish and decorative four piece mason jar canister set. The handcrafted nature of this product will produce minor differences in artwork, color/shade, size and overall design. Subtle variations will occur from piece to piece and may not appear exactly as pictured, adding to its unique qualities. Measurements may vary slightly. If buying two of the same item, slight differences should be expected. Note: Color discrepancies may occur between this product and your computer screen. Dimensions 16.0 In. X 16.0 In. X 12.0 In. I purchased the canister and cookie jar as a set. It is great quality, and looks beautiful on my kitchen counters. I use the cookie jar for dog treats! I love these little canisters for my shabby chic decor. I use them for a little grouping not as the typical kitchen canisters. They are adorable. I get compliments on these all the time. They go great in my kitchens. Worth the money. They are nicely made, shipper fast with great customer service from overstock, like always. This is always my go to site before I purchase anything. Most of the time it is bought here. BEAUTIFUL CANISTERS ALOT PRETTIER IN PERSON!! MUST ORDER ITEM!! I'm SURE WHATEVER COLOR YOU LIKE OR AVAILABLE!!! Perfect addition to my kitchen. Very nice quality. LOVE these! Really beautiful. Only minor paint drips observable, which I turned to the back. Other than that, they are great...good quality. Just what I wanted...super cute! "Are these a baby blue or an aqua blue?" My monitor is showing a baby blue. "Are the kids screw on type?" "What is each canisters dimensions?" Flour measures 6"W x 9"H, Sugar measures 5.25"W x 8"H, Coffee measures 5.25"W x 7"H, and Tea measures 5.25"W x 6"H.
"Are these canister airtight and food safe?" This item is airtight and food safe. I love the mason jar theme. Cooking is one of my favorite pastimes, which means the kitchen is my favorite part of the house. In a perfect world, my kitchen would be custom built to perfectly accommodate all my needs. However, I've figured out ways to maximize my existing kitchen storage to make cooking easier and more enjoyable.